Former Liverpool and England defender Jamie Carragher has been suspended by Sky until the end of the football season after he spat at a car. Carragher was filmed spitting from his car towards a girl in another vehicle after Liverpool's 2-1 Premier League loss at Manchester United on Saturday. He has apologised over the incident. The broadcaster says the 40-year-old, a Sky Sports pundit, will "get the help he needs to guarantee something like this never happens again". Sky says the decision was made following an internal review, adding: "Before the start of the next season we will sit down with Jamie to discuss whether he is ready to return to his role." Following his suspension, Carragher posted on social media to apologise again for a "moment of madness". 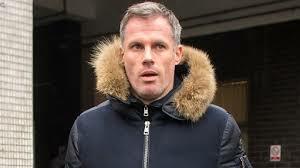 Greater Manchester Police have spoken to the motorist who filmed Carragher spitting towards his car. Enquiries are continuing but it is understood both Carragher's actions and the filming of the incident while driving could be punishable.